I took the above photo of Northeastern State University during our December 2004 visit. You can just make out some of the lettering on the arch which acknowledges the Cherokee Female Seminary connection. That history is also shown in the university seal shown below. Notice the date 1846 on the seal. I suspect this would be the year of conceptualization and establishment of the seminaries. It was not until "1847, [that] the Cherokee Nation, led by Chief John Ross, began building two educational institutions in Park Hill and Tahlequah, Oklahoma. One was for female students, the other for male students. Both schools were opened in 1851 as public education institutions which taught the equivalent of high school curriculums." And, of course, the actual relocation of the Female Seminary, at now NSU, was not until 1888-1889. My opening photo on this page shows what today is "Seminary Hall" called the "centerpiece" of the NSU campus. The picture at right, found on the Internet, shows it when it was indeed the Cherokee Female Seminary. The picture below right is also from the current NSU campus, but I am not sure what the columns are from. However, the photo I took below left is from the Heritage Center grounds. Those columns are from the First Female Seminary, which is also shown in an Internet photo (center). 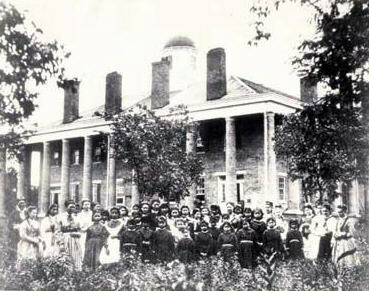 The Cherokee National Female Seminary school was founded on May 7, 1851. A related text describes it thus, "One of the first boarding schools for Native Americans was not created by the federal government, but was founded in 1851 by the Cherokee National Council. Students at the Cherokee Female Seminary took courses in Latin, French, trigonometry, political economy, and literary criticism, a curriculum that precluded any discussion of Cherokee culture or language. Pupils staged dramatic productions, held music recitals and published their own newsletter. But their graduation rate proved almost non-existent, and color and class hierarchies existed with lighter-peers referring to themselves as 'progressive' Cherokees. Still this institution helped shape an acculturated Cherokee identity in which young graduates became educators, businesswomen, physicians, stock raisers, and prominent social workers. An 1888 graduate Rachel Caroline Eaten pursued a baccalaureate and then went on for a Ph.D. in History at the University of Chicago. The author of four books on Oklahoma, two on the Cherokees, Eaten taught at several colleges including Trinity University in San Antonio where she also chaired the history department. Responding to tribal criticisms that the seminary students were ill prepared to take their places as farmers’ wives, the curriculum shifted by 1905 to include classes in 'domestic science' with cooking and cleaning predominately featured. For fifty years, more than 3,000 young women had attended the Cherokee Female Seminary, and their lives there helped to strengthen their identities as Cherokees although there were differences in opinion as to what a Cherokee really was." "The Cherokee Male and Female Seminaries were boarding schools opened by the tribal government in 1851. The male school stood southwest of Tahlequah, and its female counterpart north of Park Hill. In identical, three-story, brick structures, the Cherokee Nation offered students a high school education. The preparatory curriculum of the Male Seminary included Greek, Latin, German, and French; chemistry, botany, geology, astronomy, and zoology; geography, U.S. and English history, political economy, and philosophy. While not as rigorous, the Female Seminary's curriculum was academically challenging. Ironically, neither seminary offered instruction in Cherokee language, history, and culture. The year before the schools opened, Cherokee representatives visited New England, seeking teachers. The men and women they employed from Yale, Mount Holyoke, and Newton Theological Seminary became the first of many Eastern-educated teachers who traveled to Indian Territory to teach in the two schools. Prospective students first must pass a two-day examination, and the successful were educated at tribal expense. Although most students came from affluent, mixed-blood homes, the attrition rate was high in the early years. Twenty-six women and thirteen men were graduated from the seminaries by 1856. By that year the Cherokees had encountered economic problems. Neither seminary accepted students for the 1856 fall semester. The Civil War dashed the tribe's plans to reopen the seminaries. Used as warehouses, hospitals, and even stables, the buildings were in shambles when the war ended. A destitute Cherokee Nation could not reopen its schools until the 1870s. By mid-decade improving financial conditions enabled the Cherokees to renovate both facilities and hire additional teachers. Because of limited tribal resources, students paid for room and board when the seminaries reopened. Children of tribe members unable to pay could enroll in an indigent department. To attract more students, the seminaries admitted children from other tribes; admission requirements were reduced, and the national council created a primary department composed of grades one through five and a preparatory department encompassing grades six through eight. Oklahoma historian Grant Foreman claimed that 'the Cherokee Nation had a better common school system than either Arkansas or Missouri.' Both institutions attracted dedicated teachers, but Miss A. Florence Wilson, hired as principal teacher in 1875, made a lasting impression in her quarter-century of service. Administering daily doses of sulphur and molasses and presiding over rigorous walks, she enforced discipline with an iron hand. The educational routine at the Female Seminary was shattered on Easter Sunday in 1887, when fire demolished the building, but Miss Wilson got all the girls out. Two years later the school reopened just north of Tahlequah. Although both schools offered education rarely equaled in the surrounding states, in the years before 1907 Oklahoma statehood, federal officials began systematically reducing the authority of tribal government, including its administration of education. Two years after statehood, Oklahoma bought the Female Seminary for forty thousand dollars to house a state teacher-training school. The next year the Male Seminary, which was being operated by the tribe as a coeducational facility, burned. 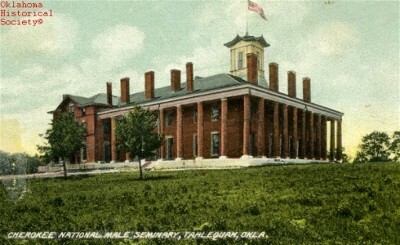 Commencement exercises held at Northeastern Normal School in the spring of 1910 honored the last students to earn degrees at the Cherokee National Seminaries." "Reverend Samuel Worcester and Reverend Doctor Elizur Butler began their missionary work among the Cherokee Tribe in Georgia before their removal, by the United States Government, to Indian Territory in Oklahoma. Each missionary’s daughter, Sarah and Esther respectively, grew up white among the Cherokee people and then returned to Massachusetts to study at Mount Holyoke Seminary. William P. Ross (nephew of Chief John Ross and later Chief) and David Vann, influential Cherokee men during that time, served as cultural brokers to the Reverends; together they began to implement educational plans at the Park Hill Mission Station. There were to be two seminaries, one at Park Hill for women and another some miles away for men. The first cornerstone was laid for the Cherokee Female Seminary on June 21st, 1847 at the Park Hill Mission Station. 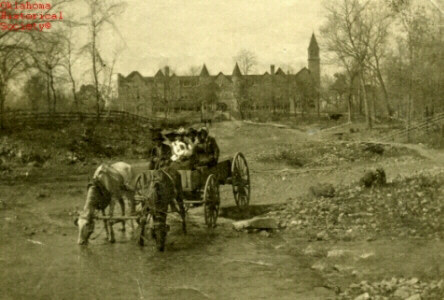 As construction occurred, Ross and Vann traveled to New England in 1850 to tour the Mount Holyoke Seminary, at the same time that the Worcester and Butler girls were enrolled. After their visit, they decided to use Mount Holyoke Seminary as a model for their own female seminary, borrowing programs of study and even Mount Holyoke graduates as principals and teachers. The Cherokee Female Seminary was opened to students a year later by Mount Holyoke Seminary graduates, Miss Ellen Whitmore and Miss Sarah Worcester on May 7th, 1851." "The [Cherokee] Female Seminary . 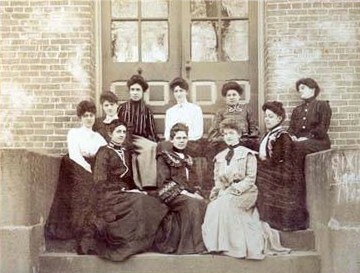 . . was the first and finest institution of higher learning for women west of the Mississippi River. The seminary included classrooms, dorm rooms, a chapel, and hospital rooms. Subjects that the women studied included Latin, math, science, rhetoric, composition, geography, philosophy, and religion. Pupils staged dramatic productions and also held music recitals. The student's attendance to church was mandatory. The students even published their own newspaper, The Cherokee Rose Buds, which was written in English and Cherokee. The paper focused on religious and moral issues, as well as the role of women in society." I will close this page with four more images from the past. Beginning at the upper left, clockwise you see the First Cherokee Female Seminary, The [second] Cherokee Female Seminary, The Cherokee Male Seminary in 1909, and some girls at the Cherokee Female Seminary in 1903. Text shown in quotation marks and historical archive images are courtesy of Northeastern State University, Mount Holyoke College, the Cherokee Heritage Center, Oklahoma Historical Society, Wikipedia, and other Internet sources.